Duct Cleaning Toronto Duct Cleaners | Special Offers! 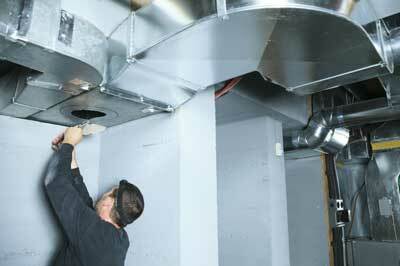 Duct Cleaning services in Toronto, Markham, Vaughan, Mississauga, Brampton & across the GTA. We are your professional, local duct cleaners.  We are NADCA certified, customer service oriented, serving Toronto & GTA since 2004. 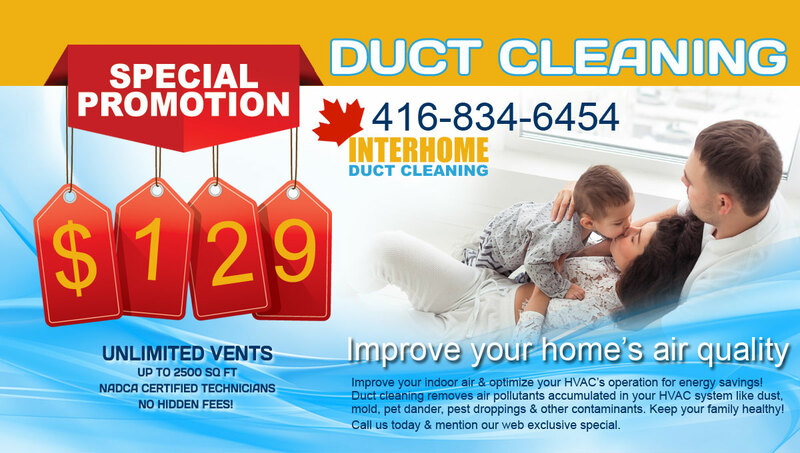 Interhome’s Duct Cleaning Toronto division has been serving Toronto and the GTA since 2004. Our duct cleaners are skilled, trained and NADCA certified. 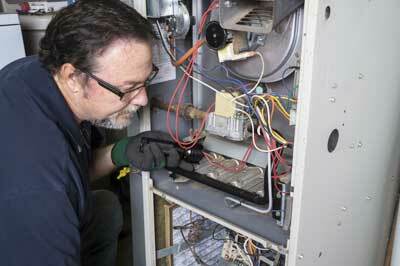 They are seasoned technicians with experience in cleaning residential and commercial HVAC systems. From hotels, apartment buildings to any size of residential property, we are proficient in facilitating any duct cleaning size project. 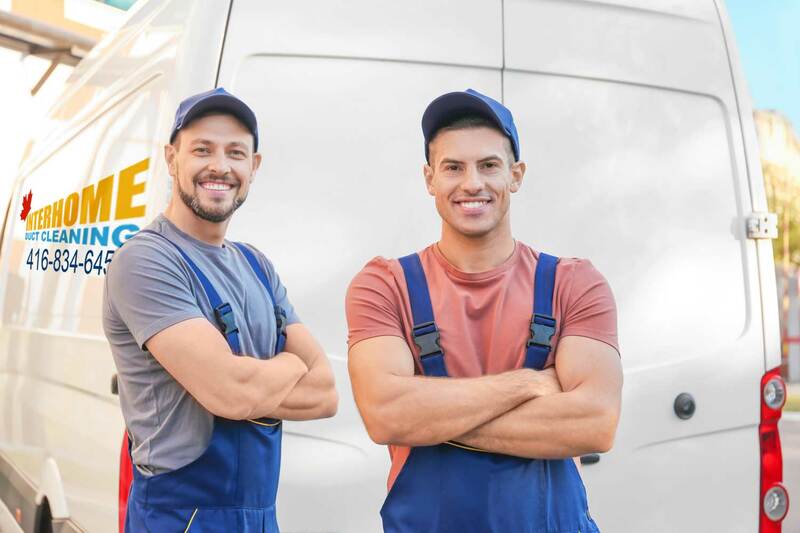 Our duct cleaners employ the latest technology truck-mounted industrial duct cleaning vacuums with an output of 240 PSI of pressure producing significant dynamic suction to clean any size of duct and vent. We employ snake cameras to investigate the condition of your ducts. We utilize an array of duct cleaning equipment like agitators, air wands and snakes to meticulously clean accumulated debris, dust, fibers, pet dander and even pest droppings from your HVAC duct system. Our services also include dryer vent cleaning, furnace cleaning, air conditioning coil cleaning and sanitization. We have made our name in the industry by providing affordable, customer service oriented duct cleaning services. From the moment our duct cleaners arrive to your property their number one goal is to provide a superior duct cleaning service conducted with professionalism and expert skill. Our pricing is affordable but not the lowest in the industry. 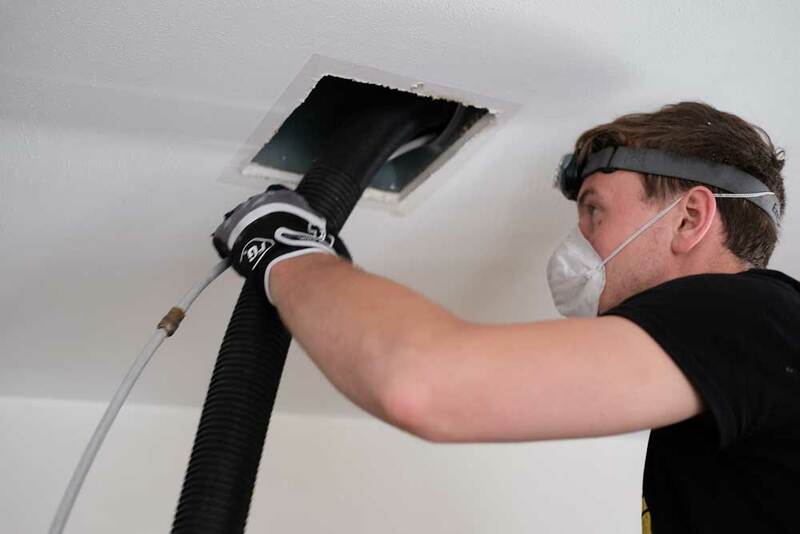 We believe pricing should reflect the quality of our duct cleaning service and not undermine the amount of time and attention to detail our duct cleaners offer. We are family owned and operated and we cultivate a company ethos of taking pride in our work. Residential duct cleaning services performed by our expert duct cleaners. Services include thorough duct and vent cleaning, dryer vent and furnace cleaning, inspection of HVAC filters and sanitization. We have provided quality commercial duct cleaning services to schools, hospitals, hotels, industrial facilities and more. Improve the indoor air of your office. We offer a on-site assessment and provide a detailed proposal that fits your budget. Beat dryer fires with Interhome Dryer Duct and Vent cleaning. 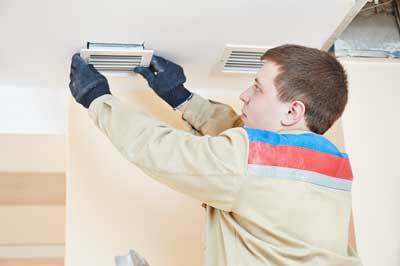 We provide meticulous dryer duct cleaning and offer special packages in combination with your duct cleaning service. Cleaning your furnace improves your HVAC's heat flow and extends your furnace's life. It also improves capacity and can lower your energy bills. Take a look at our special offers and all-inclusive packages. 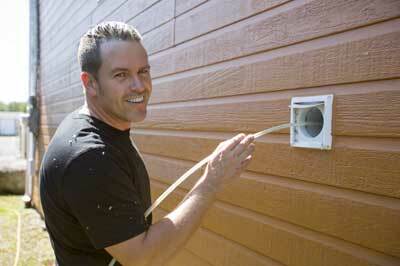 We offer unlimited vents, duct cleaning, furnace and dryer vent packages also. Take advantage of our all inclusive package! A value of $400 for $299! 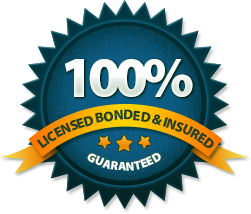 Includes: Hookup, Unlimited Vents, Dryer Vent Cleaning, Furnace Cleaning & Sanitization. 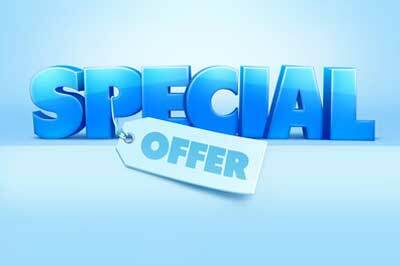 Add on our furnace cleaning to your duct cleaning service for just $99! Regular price $120. Add on our dryer vent cleaning to your duct cleaning service for just $79! Regular price $100. Our company pays special attention to the details of every project to ensure the complete satisfaction of each client. Providing exceptional customer service is what we aim for. Our Interhome technicians are skilled duct cleaners, fully certified under NADAC, the national certification program for air systems cleaning specialist (ASCS), focusing on all aspects of HVAC cleaning systems including practical knowledge, industry codes, standards, principles of HVAC operation, and field experience. Be wary of companies that can come to your location and garner additional fees for their service, like a hookup fee, inspection fees and other. We offer an upfront all inclusive price with no hidden fees. We will provide you with a list of the services included in our price so you can make an educated decision based on your duct cleaning needs. Having untrained duct cleaners with subpar equipment can result in a mediocre at best cleaning but you also run the risk of damage to your HVAC system. We often upgrade our equipment to the latest technology and invest in new training programs for our duct cleaners. Call us and talk to one of our knowledgeable booking agents. They will answer your questions and address your concerns. They will ask specific questions to determine your needs and will explain your options. Don't forget to ask them about our monthly specials! We offer 7 days booking from 8am to 8pm. 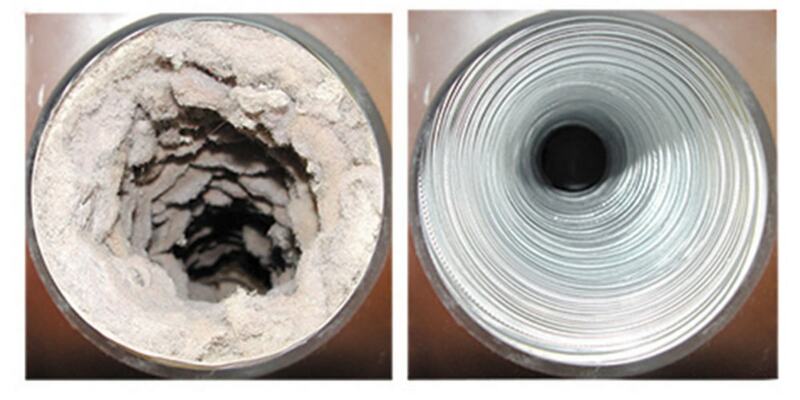 We will describe the process of our duct cleaning services and ask questions specific to your HVAC system. We will inform you of any areas that should be accessible to us at the time of our visit. On the day of your booking our crew will arrive at your location and will begin the process. They will use snake cameras to investigate the level of debris and dust in your ducts and will take before and after photos to show you. They will determine the access points, seal your vents to maximize negative pressure and begin the duct cleaning process. Our cleaning process is thorough and we will keep you updated through out of it. When the duct cleaning has been completed we will take after photos with our snake cameras to show you the results. If wanted we will do a free inspection of your HVAC filters and dryer vent to determine if they need cleaning. Interhome was referred to us by our neighbour. They arrived on time, their service was professional, they did detailed work and even found a leak from one of our duct pipe which they sealed. I would hire them again. I have used Interhome Duct Cleaning a couple of times through the years. They do a good job and they leave the house exactly as they found it, spotless. After our months long renovation we decided to have our ducts and vents cleaned to remove any dust and debris that found its way into the vents. The Interhome crew was friendly, showed us on the camera before and after the cleaning and overall we were very happy with their service. Definitely I will recommend to friends and family. Both my kids suffer from asthma and our doctor suggested that it would be worth having our HVAC duct cleaned and replace our filters too. I am happy I found Interhome, John was very informative on the phone and when he came with the crew he explained everything thoroughly and the process was painless. We contracted Interhome Duct Cleaning for our commercial property downtown Toronto. The assessment and recommendation process was eye opening to say the least. They honored their contract, stayed on time and were mindful of our budget. Would recommend.